Poetry. Literary Nonfiction. Hybrid Genre. Latinx Studies. LGBTQIA Studies. California Interest. Reading ATTENDANCE trains your attention on plants and animals until you can't stop noticing them. It's a way of moving through the natural world--which turns out to include the whole world. An almanac, a logbook, a devotional, a witness statement, poetry. A documentary not in the sense of capturing but in the sense of being a creature paying attention to the world we already live in. It's a hybrid text: One year of two people reaching their arms across styles and genres. At times notes, at times lists, or run-on sentences, or poems, or things that want to be poems, but always plants, and always animals. The words are offered up with no correction or with the revision exposed. This is writing that includes where it comes from or writing that painfully doesn't become. We hold so many questions about love and attention and violence. "I expected to be moved by this collaborative work from Rachel McLeod Kaminer and Roc o Carlos--they are two distinct and beautiful poets after all. But what I didn't expect from ATTENDANCE is the way it brought the life around me to life. How the birds and the trees and the landscape began to move in ways I hadn't noticed before, how my skin began to feel enveloped by the details of the day. Great art has always made me know that I belonged in the world, that I wasn't wandering through it alone. 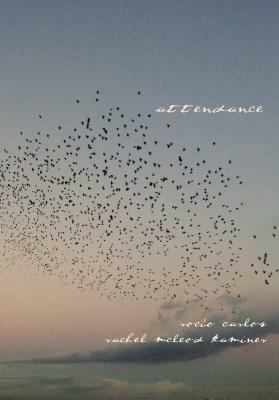 And ATTENDANCE, as much as any recent book, has reminded me of this truth." --Chiwan Choi.